Dandelion has a bad reputation as an invasive weed, but it actually has great nutritional and medicinal value. Learn all about its many benefits. The first appearance of dandelion is subject to debate, but most scientists agree that the species emerged from Eurasia and was later introduced to other regions, resulting in its current naturalization on every verdant continent in the world. 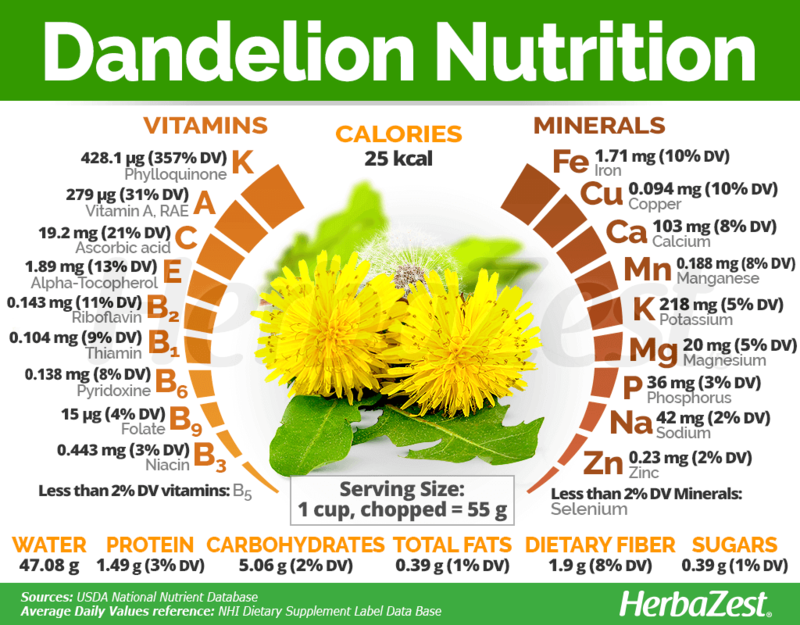 Today, many consider the dandelion as a garden nuisance, but its value is increasing as science begins to validate its great potential for nutrition and health. Stimulating urination. 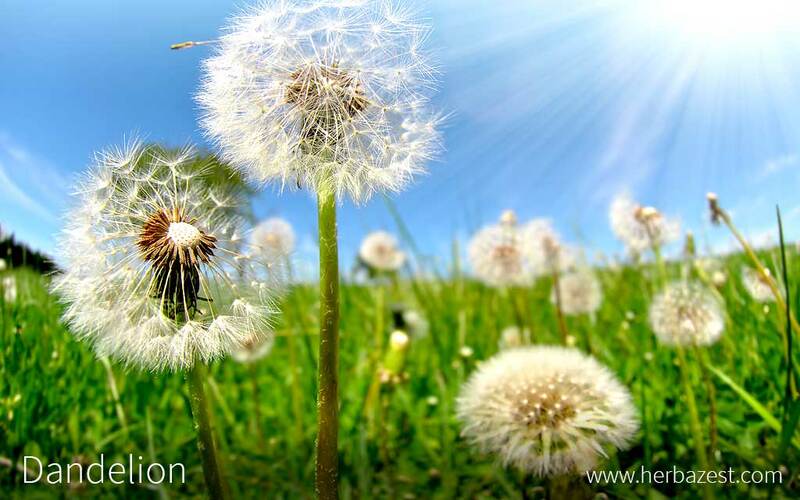 The diuretic properties of dandelion aid the elimination of excessive body fluids and toxins through the urine. Improving liver function. 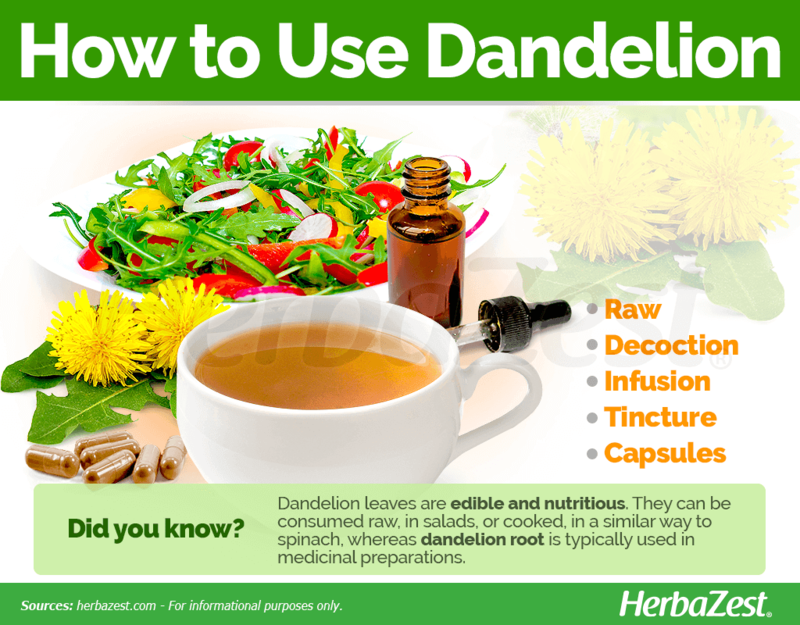 Dandelion has been traditionally used to treat poor digestion due to a sluggish liver. Additionally, the bitter compounds in dandelion help increase appetite. The herb is also thought to promote bowel movements; however, its mechanism of action is yet to be understood. 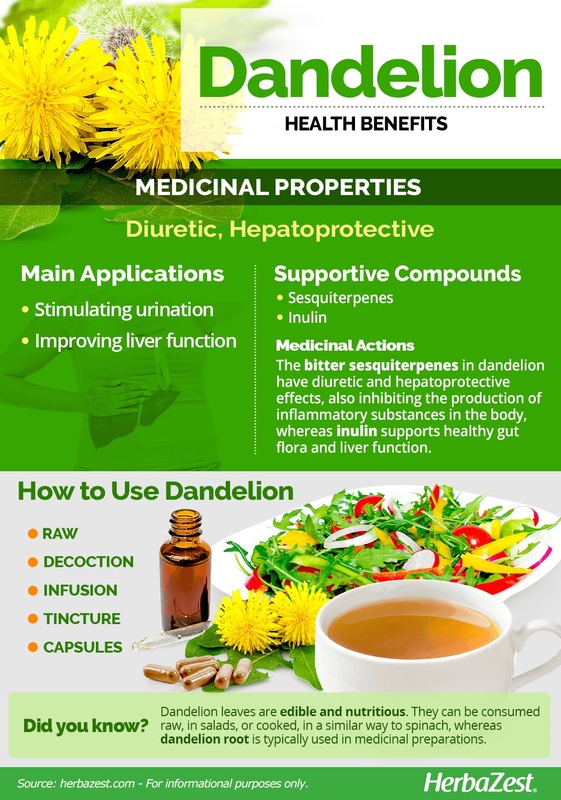 While the mechanisms behind the medicinal properties of dandelion (mainly diuretic and hepatoprotective) are yet to be explained, the herb boasts phytochemical compounds that may be responsible for many of its therapeutic actions. It is thought that the major medicinal compounds in dandelion are sesquiterpene lactones, and it has been observed that dandelion leaf extract can inhibit the production of inflammatory substances in the body; however, not much is known about the mechanism of action behind these beneficial effects. On the other hand, the roots of dandelion are rich in inulin, a type of carbohydrate that supports healthy gut flora and has been suggested to be responsible for the digestive properties of the herb. Inulin is not digested by the human body, so when it passes to the colon gets fermented and feeds the intestinal microbiota, thus promoting gastrointestinal health. Additionally, like other leafy herbs, dandelion contains bitter compounds, which help increase appetite. Asparagus, celery, and cucumber also exhibit diuretic properties, and similar hepatoprotective benefits can be found in artichoke, boldo, and chicory. Side effects when consuming dandelion are rare. However, there have been reports of some people experiencing kidney problems and gallbladder-related issues after eating dandelion. 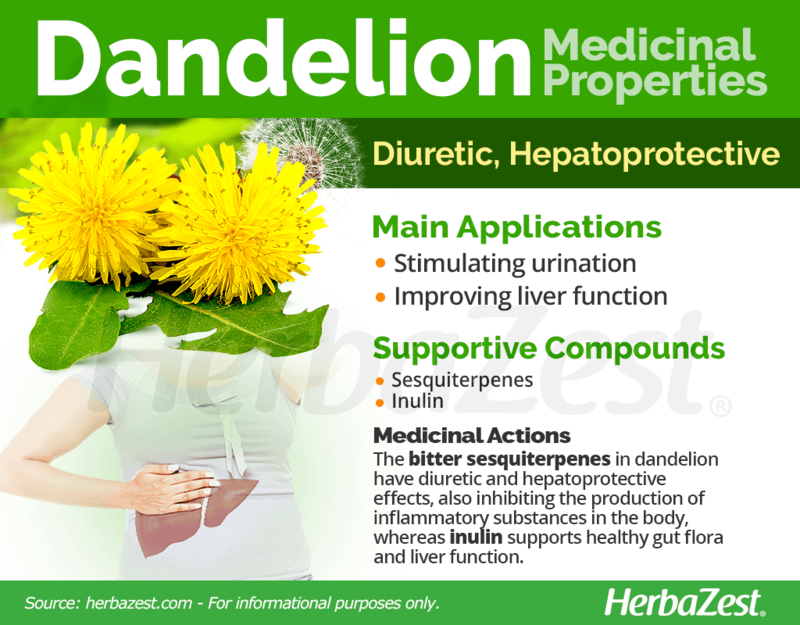 Due to the diuretic effects of dandelion, it may interact with certain medications. Dandelion has garnered fresh popularity in recent years thanks to its impressive nutritional profile. Due to its outstanding levels of vitamin K (phylloquinone), this herb can be considered as a great source of this important nutrient, which aids coagulation and has been linked with higher bone mineral density, thus helping cicatrization and preventing fractures. Often treated as a garden nuisance, the humble dandelion is an excellent source of vitamin A (from carotenoids), which is essential for tissue regeneration and helps prevent eye diseases, like glaucoma and macular degeneration. Dandelion leaves also provide good amounts of vitamins C (ascorbic acid) and E (alpha-tocopherol). Vitamin C is a crucial compound for proper absorption of plant-based iron, as well as for bone formation and immunity, whereas vitamin E strengthens the immune system so that it can fight off invading bacteria and viruses. Additionally, dandelion offers adequate concentrations of B-complex vitamins, mainly B1 (thiamin), B2 (riboflavin), and B6 (pyroxidine), as well as essential minerals, such as calcium, iron, magnesium, potassium, copper, and manganese, also including small amounts of phosphorus, zinc, and selenium. A cup of dandelion leaves (55 g) provides only 25 calories, as well as 8% of the daily value for dietary fiber. Dandelion is not common fare on contemporary menus, but it is quite edible and indeed nutritious. Dandelion leaves can be consumed raw or cooked, and supplements have become available in light of the discovery of dandelion's medicinal uses. The root is the part typically used in medicinal preparations. Raw. The leaves of dandelion can be utilized raw in salads, cooked into soups, or act as an ingredient in larger seafood or pasta dishes. Ground and roasted dandelion root also functions as a decaffeinated coffee. It is known among chefs as a member of the bitter greens. Decoction. This preparation is obtained by boiling the roots of dandelion in water for few minutes in order to concentrate its bitter compounds and diuretic benefits. Infusion. The roasted roots of dandelion can be made into an herbal tea or tisane, and can be mixed with other herbs to potentiate its digestive, hepatoprotective effects. Tincture. The whole plant is submerged in a neutral alcohol and kept in a dark cabinet for about a month in order to extract its medicinal properties. Few drops of dandelion tincture, diluted in a glass of water, can be used as a liver and gallbladder tonic. This preparation is not recommended for during pregnancy. Capsules. In order to make the most of the hepatoprotective and diuretic properties of dandelion, the dried and ground roots can be inserted into gelatin capsules to be taken orally in medicinal doses. Dandelion grows wild throughout the world, and for many, finding the plant may be as simple as walking outside. Its growing season lasts throughout spring and summer, as it can tolerate a wide range of temperatures. Specialized health stores and online retailers carry dried roots and leaves year-round, but supermarkets rarely sell the herb. Specialized health stores and online retailers stock dandelion supplements with herbal remedies. The widest variety can be found online where consumers can compare prices, forms, and concentrations for the best personal results. Many choose to eliminate dandelion from lawns and gardens, but those who wish to cultivate the herb have very little trouble doing so. Dandelion can withstand temperatures as low as -38°F (-39°C) in short bursts. It is advisable to plant seeds in early spring, as lower temperatures at the start of germination produce more flowers later on. Moist soil is the only truly key component, as light exposure and pH levels are largely insignificant to the plant's success. The unbranched taproot of the dandelion plant can produce more than ten purplish-green stems that grow up to 27 inches (70 cm) tall in the right conditions, though generally they range from 2 - 16 inches (5 - 40 cm) in height. Jagged-edged leaves and the yellow-then-white radiating spores of each flower give the herb its well-known shape. Dandelion (Taraxacum officinale) is a member of the Asteraceae family, along with other 23,000 species, notably including artichoke (Cynara cardunculus), chamomile (Matricaria chamomilla), lettuce (Lactuca sativa), and marigold (Tagetes erecta). Dandelion taxonomy is unusually complicated, as its reproductive methods are not fully understood. Almost innumerable subspecies and microspecies exist around the world, with roughly 70 recognized in Germany alone. The three most commonly grown are 'rough dandelion', 'wandering dandelion', and 'common dandelion', which differ slightly in their respective native regions. The botanical name of dandelion, Taraxacum, comes from the Arabic word tarakshaqum, which translates as "bitter herb." The dandelion herb has long been cultivated in its native regions for use in herbal medicine, with its earliest records dating back to the 10th and 11th centuries in the Middle East. India has also used the herb to this effect, as well as Native American tribes in the New World. The herb began to garner culinary interest in France, where it was later used in making wine. Global ubiquity has created little demand for dandelion cultivation, as the plant can - and will - grow almost anywhere: over 70 million tons of weed killers are applied to lawns and gardens every year in an attempt to curb its spread. New technology, however, has found that the roots of a certain Russian strain of the herb can be made into rubber. This may one day substitute production of the material from fossil fuels, which currently costs the world about $50.4 billion USD annually. Further development may find it to be a major natural ingredient of the future. Dye. Natural dyes of yellow and green tones are extracted from the dandelion flowers. Repellent. The latex from the dandelion stems can be used as mosquito repellent. Tires. A rubber-like substance produced from the latex stems has shown promising results for its possible use in car tire manufacturing, though supplies are still limited.